Although the term "family planning" is a politically-charged topic in the United States, surveys show that most families (even those to claim to be the most devout) make use of contraception. Sadly, in many parts of the developing world, this is not an option for the majority of people. 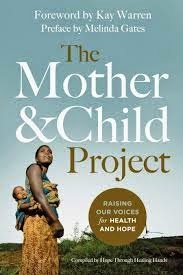 The book The Mother & Child Project is a collection of essays from people like Melinda Gates, Hillary Clinton, Dr. Bill Frist, Jimmy Carter, and Kay Warren (wife of pastor Rick Warren) on the topic of helping countries prosper by improving access to health care for women and children. The statistics discussed are alarming and heart-breaking: nearly 300,000 women die in childbirth each year and nearly 7 million children die before the age of 5 from preventable causes. The authors in this book are arguing for access to contraception methods which would greatly improve maternal health by allowing women to space out the births of their children and to allow their bodies to heal and prepare before they give birth again. This relatively simple idea would save many lives as well as allow many more girls to continue their education longer and therefore be better able to support their families. Most of the authors in the book take great pains to explain that access to contraception does not include abortion. Contraception is not the only solution to the problem of repeated pregnancies -- in many of the areas discussed in the book, the cultural norm is toward big families, so many of the people who work in these areas must try to educate the communities on the benefits of smaller families. There are many personal stories told of great suffering, due to a lack of resources, education, and entrenched views that women are only valuable as childbearing machines. The work that the Hope Through Healing Hands project is doing to reduce maternal and child mortality is vitally important and already showing great success. While I was deeply moved by the essays in the book, having so many authors who all basically have the same message meant that there was a great deal of repetition. If you sit down to read through the book, each essay, sooner or later, will impart the message that HTSP (Healthy Timing & Spacing of Pregnancies) is the most important aspect of preventing maternal and child deaths. Still the overall message is so important that this is a small quibble in an otherwise important and ultimately inspiring book.